perfumes: Gardenia Elizabeth Taylor By Elizabeth Taylor For Women. 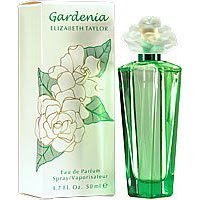 Gardenia Elizabeth Taylor By Elizabeth Taylor For Women. Launched by the design house of Elizabeth Taylor in 2003, GARDENIA ELIZABETH TAYLOR is a women's fragrance that possesses a blend of gardenia, jasmine, lily of the valley, orchid, rose, white peony, carnation, and musk It is recommended for casual wear.